Australia’s chic southern city offers a world of choice for hungry gourmands looking to indulge in epicurean delights. From the exciting foodie festivals held every month of the year to the sublime restaurants which seem to be popping up on an almost weekly basis, Melbourne is a hub for anyone who loves their food. The city’s fine dining scene is so highly acclaimed that it attracts foodies from all over the world, eager to endure lengthy long-haul flights for the chance to savour the creations dreamt up by home-grown and international chefs who have formed one of the most dynamic food hubs on the planet today. 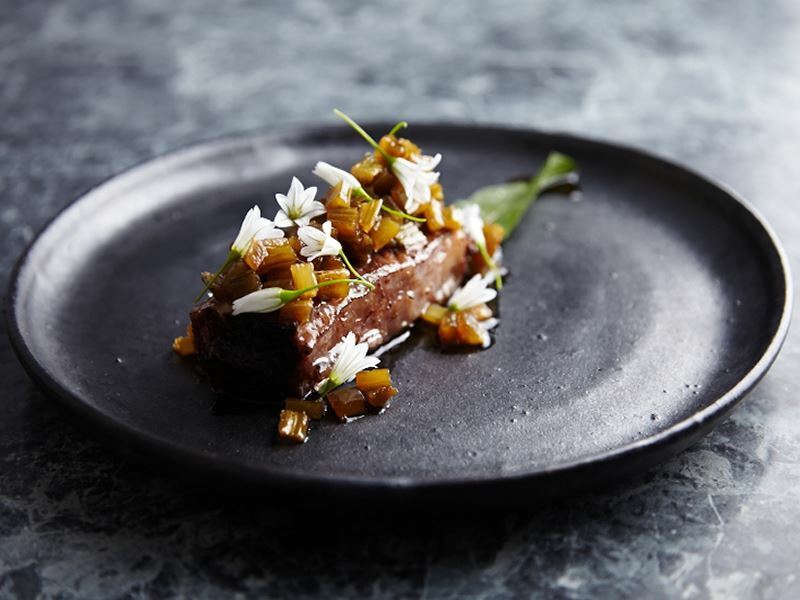 If you’re keen to satisfy your cravings in the most gourmet way possible, take a look at these top 10 fine dining restaurants in Melbourne. 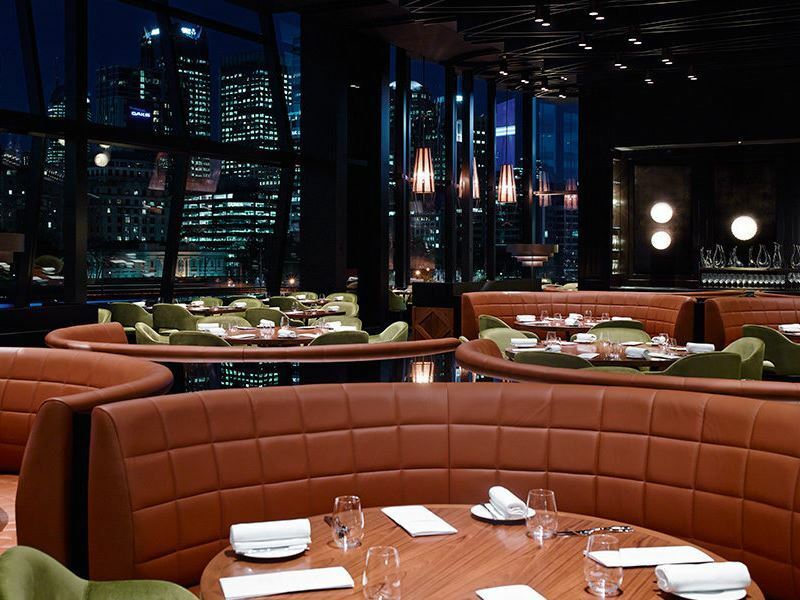 The scene: Dining at Vue de Monde is like being suspended in the centre of the galaxy. 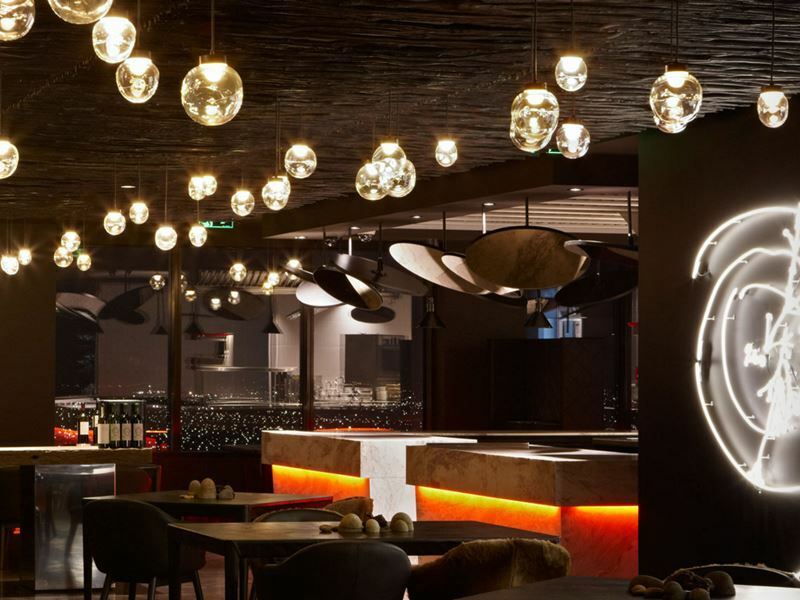 At this top end restaurant perched 55 storeys high, black walls dominate the space, while orb-like lighting hangs from the ceiling and the city lights twinkle far below, creating an out-of-this-world environment that perfectly matches the nature of the food. A seasonal tasting menu featuring an international mix of modern Australian and European food is served for lunch and dinner with an eclectic array of appetisers, starters, main courses, palate cleansers and desserts, all served in miniature portions so you’ve got enough room to savour every bite. There’s a hint of kitchen trickery afoot, like grilled garlic butter oysters nestling in a tiny sandpit and kangaroo steaks served sizzling on a log-like piece of burning charcoal, but for most of the dishes, the flavours and textures are allowed to speak for themselves. Signature dish: The truffle risotto, with several different varieties of delicate truffle folded into the rice, topped with large pieces of shaved truffle and framed with a truffle coulis. The scene: From the moment you step into Maha, you’ve started your journey to the Middle East. This exotic eatery boasts a youthful and refined environment that highlights the beauty and opulence of the continent in the form of smooth beats, elegant textures and sweet aromas which set the tone for the heady experience ahead. The menu takes a fresh, unrestricted and innovative approach to Middle Eastern cuisine with a touch of Mediterranean influence. Choose between 2-, 4-, 5- and six-course set menus for dinner, each of which comes with and a lavish selection of plates, such as orange blossom-glazed pork cutlets, cinnamon butter-poached chicken and chemen-cured swordfish. There’s also a lighter a la carte weekday lunch menu, plus an extensive vegan and vegetarian menu, bursting with flavours and colours. You can complete your sumptuous feast with an optional wine pairing or try something a bit more adventurous from the swanky cocktail menu which highlights Middle Eastern ingredients. Signature dish: 12-hour slow-roasted lamb shoulder, served with smashed pickled radish and harissa. 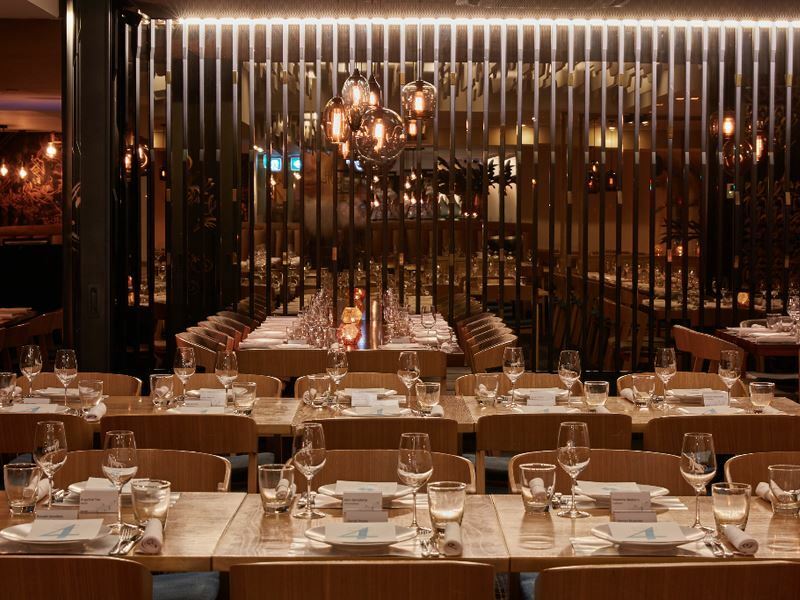 The scene: Inspired by unusual flavour combinations that surprise and charm the palate, Ezard has been serving Australian freestyle cuisine for over 17 years, tucked away in the basement of the Adelphi Hotel, along one of the city’s most eclectic streets. The whitewashed walls, crisp linen tablecloths and courteous staff all point to a fine dining restaurant, but the cuisine is a lot more exciting and fun than you might expect from such an elegant dining venue. 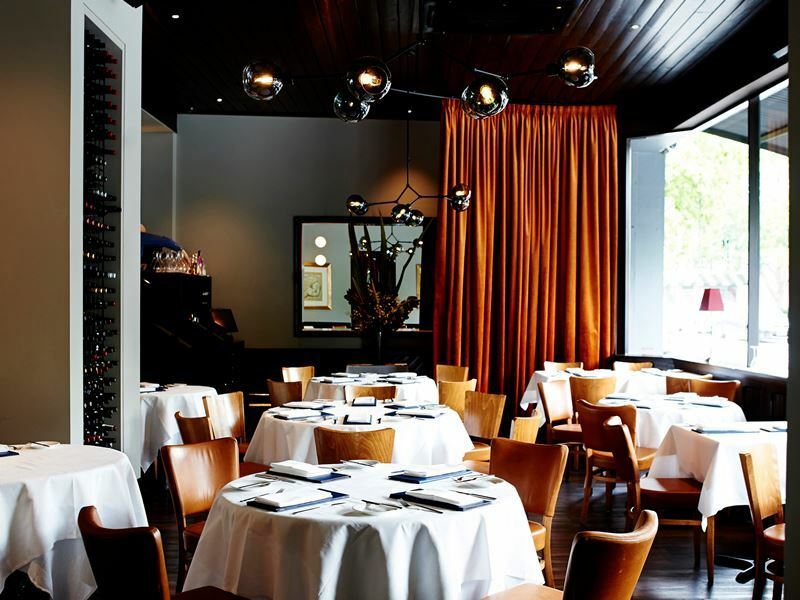 Using only the finest local and seasonal produce, Teage Ezard creates a selection of tantalising menus from weekday express lunches and pre-theatre dinners to sophisticated a la carte offerings and an eight-course tasting menu with complementary wines to match. From mouth-watering steamed scallop dumplings served with three types of seaweed and the enticing Chinese-style duck breast with a chilli dressing to the decadent Ezard dessert tasting plate to share which is calling your name even though you’re full to the brim, there are so many must-try dishes here that you’ll be making your next reservation before you leave your seat. Signature dish: Japanese-inspired oyster shooter with yuzu, cucumber and apple. The scene: Offering a calming sanctuary at the top end of town, The French Brasserie provides the ideal environment to relax while enjoying the very finest in modern French cuisine. Lofty ceilings and soaring glass windows create a bright, contemporary atmosphere which matches the simple, yet stylish plates crafted entirely in-house by the talented head chef. 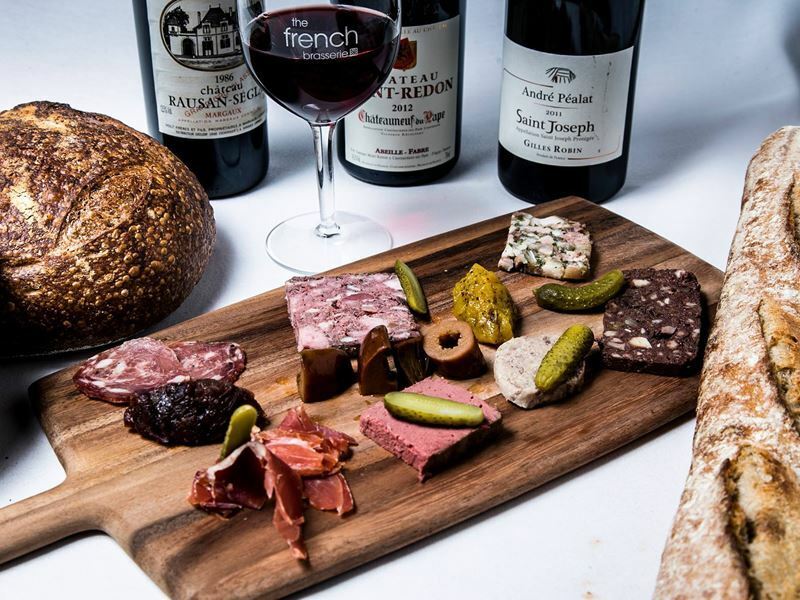 The evening a la carte menu features a selection of bite-size hors d’oeuvres, exquisite starters, generous main courses and classic side dishes, all of which pair perfectly with the distinctive Australian and French wines thoughtfully selected by the restaurant’s master sommelier. Classics such as French onion soup and ratatouille feature alongside Mediterranean-inspired dishes, like sea bream in warm gazpacho. For a truly gourmet experience, opt for the notably affordable five-course tasting menu and splash out for the matching wine – you will not be disappointed. Signature dish: Cassoulet: white bean ragout with a confit duck leg, pork belly and Toulouse sausage from Castelnaudary. 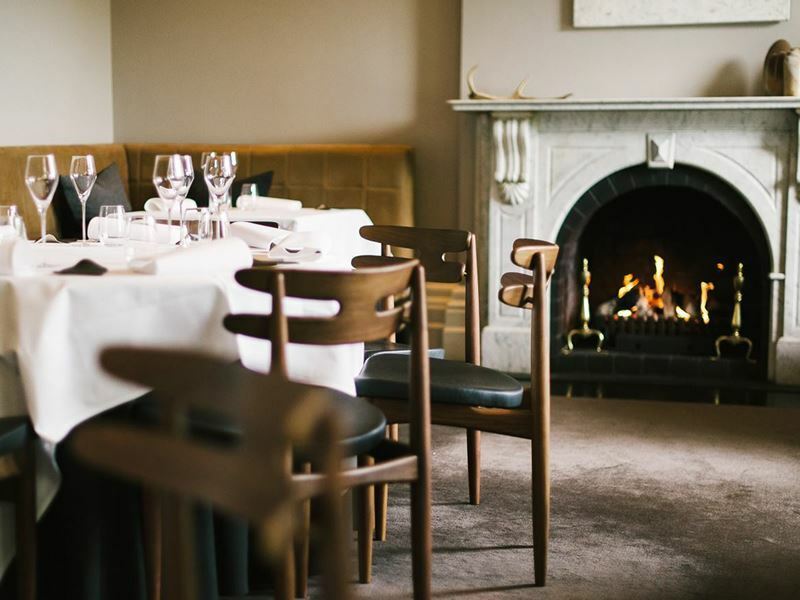 The scene: Woodland House is the place to go when you want the traditional fine dining ambiance. Expect perfectly-pressed crisp linen tablecloths, pale grey walls, very polite wait staff and a pretty garden view through the over-sized windows that could trick you into thinking your dining in an old English cottage. But although the atmosphere can feel a bit formal and proper, the food is anything but. An exciting blend of contemporary Australian and modern European, the multi-course tasting menu at Woodland House treats you to a memorable dining journey with a many surprises on the way. From unusual yet delicious small plates of fried duck tongue with bamboo salt to the equally unexpected yet delectable pigs’ head fritters, you’ve got to be an outgoing diner to eat here. But if your reservations get the better of you, you can relax knowing that a flavoursome plate of wagyu steak with horseradish emulsion or a rich baked Alaska bomb dessert is never far away. 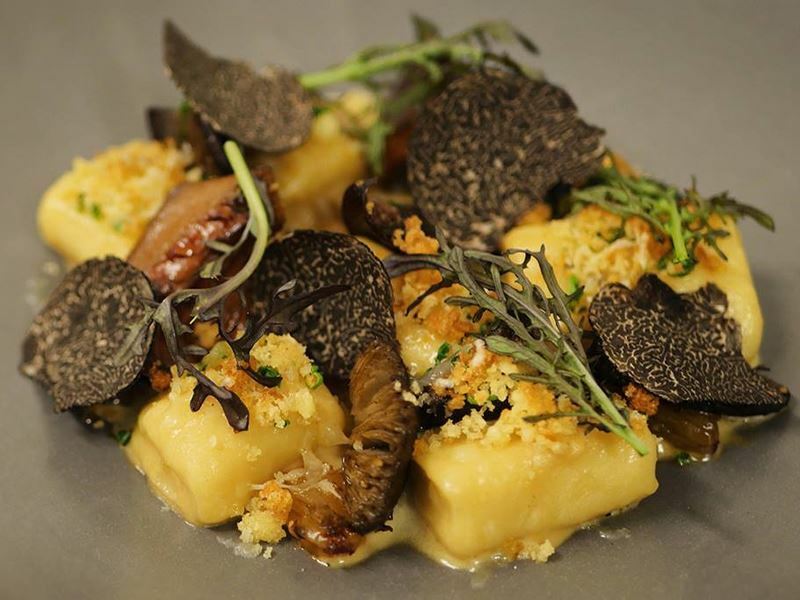 Signature dish: Due to the seasonality of the tasting menu, there’s no signature dish at Woodland House. The scene: The near-perfect imitation of his acclaimed restaurant in London, Dinner by Heston Blumenthal is tricky to describe in just one paragraph. Serving dinner, just as we know it, this quirky restaurant looks fairly ordinary, with its full-length windows, black-washed walls and mismatched yet chic textiles. But as soon as your first plate arrives, you’ll start to understand the extent of Dinner’s eccentricity. The a la carte menu is laden with modern dishes inspired by historical British food dating back to the 1300's, all with a dash of Australian influence. From the roast bone marrow served with a Welsh cake and snails to the ice cream accompanied by Vegemite and a sourdough crumble, everything on the menu has a rich history and although it might not sound like something you’d expect to see gracing a celebrity chef’s fine dining menu, the lengthy waiting list to get a table reservation suggests otherwise. Signature dish: Meat Fruit: a chicken liver parfait carefully disguised to look like a mandarin, served with grilled bread. The scene: Taking a slightly different approach to fine dining, IDES keeps everything as simple as possible, from the minimalist black and white décor to the single-sitting dining style and the food which comes exclusively in the form of a six-course tasting menu. Unless you visit on a Wednesday or Thursday, when you can sample an affordable four-course menu comprised of brand new dishes never served in the restaurant before. IDES can only seat 36 diners per evening, but this creates a somewhat privileged feel, like only a handful of people are lucky enough to experience what’s coming. Although the menus keep the same structure and the cuisine is reliably modern Australian, the dishes change constantly, and often at the last minute to inspire spontaneity and high-energy. Technique-driven, flavour-packed dishes are a regular highlight, including rich pork broths, delicate confit chicken and punchy saffron ice cream, but not knowing exactly what you’re sitting down to is all part of the fun. Signature dish: Because every tasting menu is different, there’s no signature dish. But chef/owner Peter Gunn is well-known for his wagyu short rib, so if anything similar features on the menu, you’re in for a treat. The scene: Set in the heart of Melbourne’s most dynamic culinary precinct, Coda has established itself as a lively and innovative addition to the city’s best fine dining restaurants. Best known for its high-octane energy which billows out the doorway and enticing passers-by to enter, this eatery flaunts a simple, strikingly modern interior, with exposed lightbulbs, wire mesh screens and aluminium-framed windows. 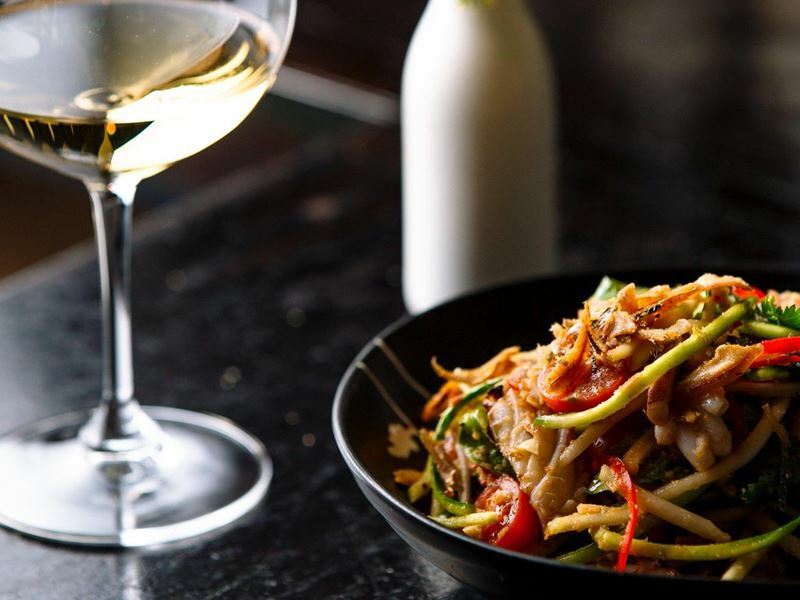 The cuisine here is just as contemporary and diverse as the surroundings, with a broad selection of French-Vietnamese plates and a handful of Australian dishes on the menu. Most of the menu items are served in small sizes meant for sharing so you can treat your taste buds to a little bit of everything. From the blackened quail served with shiso salad and yellow fin tuna with lotus root to the Berkshire pork loin with apples and the chef’s selection of petits fours, everything on the menu has been designed with an honest passion for innovation, seasonality and balanced flavours. Signature dish: Roasted yellow duck curry: tender duck legs in a thick bowl of rich curry scattered with fresh coriander leaves and crunchy lotus root. 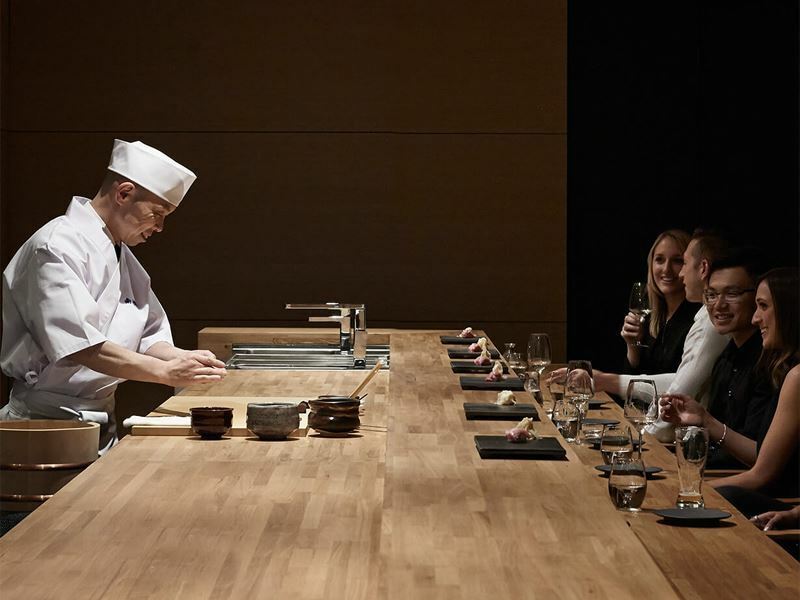 The scene: Dining at Minamishima is a real treat for all the senses. From the breath-taking display of knife skills to the incredibly precise presentation of each plate and the captivating glisten of fresh seafood, your senses will feel full to the brim before you’ve placed one morsel into your mouth. Offering the most intimate Japanese dining experience you’ll find anywhere in the city, Minamishima doesn’t have a menu. Instead, diners pull up a chair at the long wooden table in front of the master chef and instantly become enthralled as he puts his skills to work creating a unique progression of fine courses that highlight the appearance, balance and textures of fresh and flavourful raw ingredients. There’s also a separate dining room where the food focus extends to cooked dishes, but the live-action preparation and the fresh-as-can-be sushi showcased in the former area is one you won’t want to miss. Signature dish: Since there’s no menu, there’s no signature dish. But chef Komeyui’s signature ingredient is the sea urchin, so expect nothing short of gourmet heaven when this is presented to you. 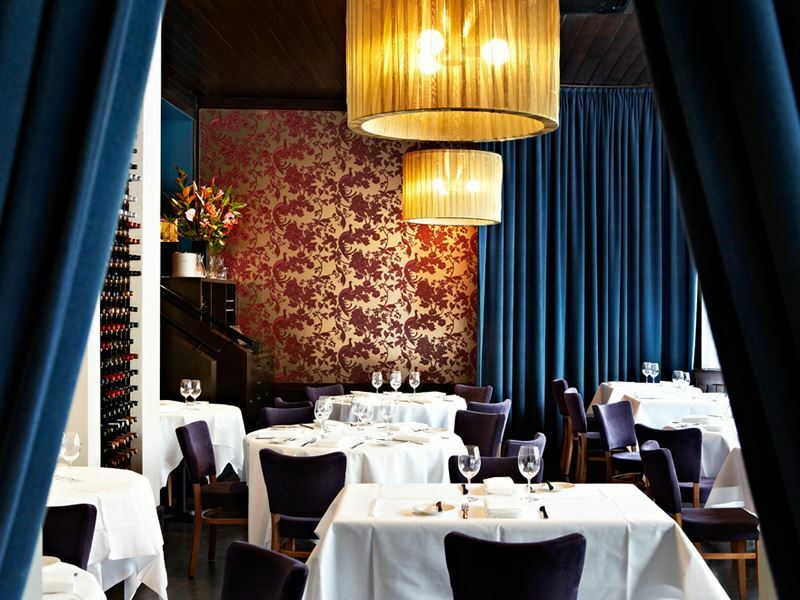 The scene: Representing the pinnacle of fine dining in Melbourne, Matteo’s exudes luxury from the very beginning. From the deluxe interior boasting deep purple chairs, gilt mirrors and ornate chandeliers to the Asian-European fusion menu dripping in exotic flavours, a myriad of textures and fascinating ingredients, every part of Matteo’s confirms is to be the dapper and slightly eccentric aristocrat of the city’s fine dining scene. New additions are made to the a la carte menu every day as ingredients come into season and almost every item offers a perfectly balanced blend of Asian and European flavours and cooking techniques. The roasted quail served with bacon and Chinese sausage, the suckling pig with extra pork belly and wombok kimchi, and the butter-poached marron tail with fried scallops and Singaporean chilli sauce are all comfortingly familiar while still being excitedly unusual. For an extra special treat, swap the a la carte for the tasting menu, comprised of five courses, including the chef’s daily selection of bite-size appetizers, and optional Victorian wine pairing. Signature dish: Lemon chicken: a chicken breast fried in the Japanese Karaage style and served on a bed of fluffy coconut rice doused in lemongrass sauce.